While the final EA will not be issued until public comment has been accepted for the draft, this is welcome news. The U.S. Forest Service (FS) and the BLM have a very long history involving oil and gas development. The WNF has been managing drilling for nearly a century and continues to do so today with over 1,200 active wells on the surface of national forests. Unlike most other national forests, the WNF is not comprised of contiguous acreage. It is a patchwork of acreage adjacent to privately held minerals, and even encompasses private minerals under the surface of the WNF. In fact, 59 percent of rights to the minerals beneath the WNF are actually privately owned and scattered throughout the forest. This makes it virtually impossible for private landowners to have their minerals developed if federal leasing is not allowed. Given this unique “split-estate” scenario—where the federal government owns the surface rights and private landowners own the minerals beneath the majority of land—it is easy to see how this debate is really one that centers around property rights. This focus on property rights was especially clear over the last few months as landowners turned out in force when the national Keep It in the Ground movement parachuted into local communities, disrespecting our laws, our regulators, and most importantly the local men and women who actually live and work in the Buckeye State. Throughout the rounds of public meetings that resulted in over 3,400 public comments, landowners, elected officials, unions, economic development groups, and concerned citizens stood up against the Keep It in the Ground organizers. These locals told BLM they support leasing in the forest and the protection of their property rights. They asked the agency to base its decision on sound science and facts instead of the emotional rhetoric coming from outsiders that don’t speak for them. At the end of the day, it appears the BLM not only heard these voices, but also took into consideration discussions held with native tribes, and consultation and external scoping with other coordinating state and federal regulatory bodies. The result is an Environmental Assessment that is extremely comprehensive and lays out a compelling case as to why leasing should be permitted to move forward. Further, the EA also found that the Proposed Action is in compliance with the Final Revised Land and Resource Management Plan, Wayne National Forest (2006 Forest Plan), which incorporated a Supplemental Information Report (SIR) that was added to the plan in 2012. This should not be surprising for anyone who has actually read the SIR given that the most recent EA was essentially conducted as an added layer to already existing environmental reviews that had been previously made by the U.S. Forest Service, the Wayne National Forest, and the Bureau of Land Management. Recalling that activist groups completely discounted the SIR and its merit only a few months ago when they submitted their comments, it’s clear their case did not hold water, yet again. 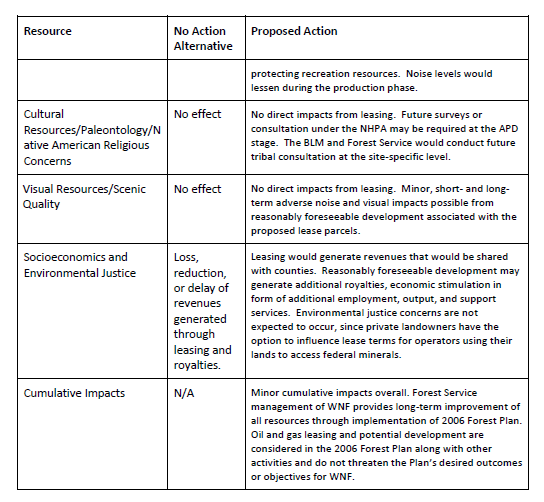 Table ii highlights the potential impacts leasing in WNF (Proposed Action) would have on forest resources. 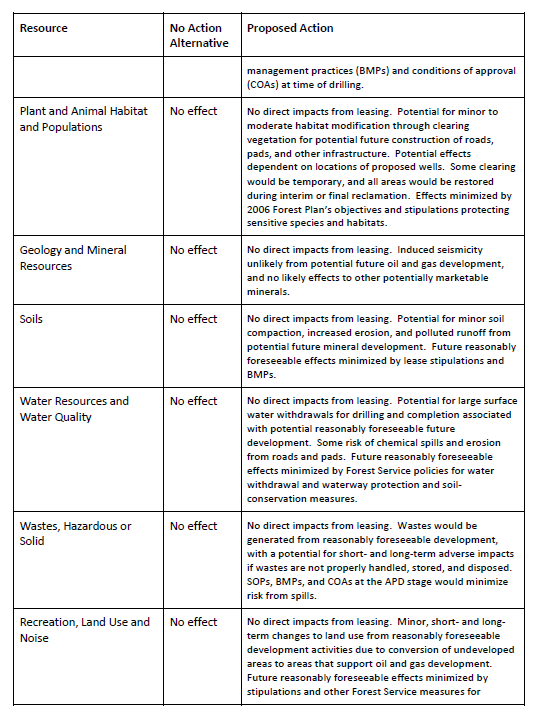 Obviously, by not allowing leasing (No Action Alternative) there would be “no effect” to these resources, but also notice that there are “no direct impacts from leasing” on every one of them, resulting in “minor cumulative impacts” overall to the forest system.